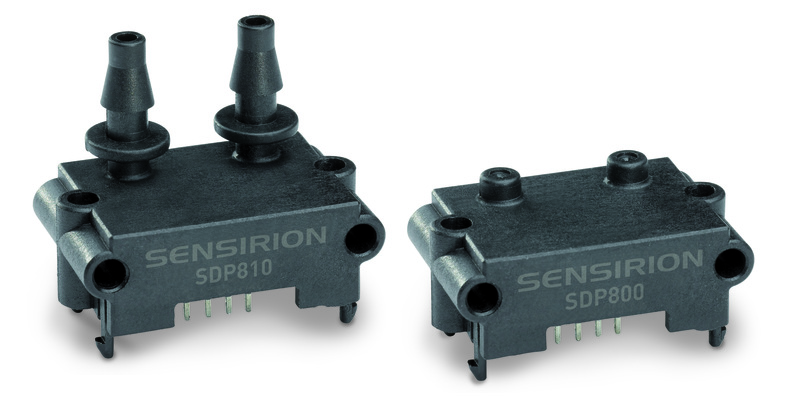 Sensirion has launched new product variants of the SDP800 differential pressure sensor series. The SDP801-500Pa and SDP811-500Pa complement the product portfolio with an additional I2C address that enables the connection of two sensors to the same I2C bus. The SDP800 series are designed for applications like water heaters, burners, VAV controllers and medical respiratory applications. The SDP800 sensors offer a measurement speed of up to 2 kHz. The fully calibrated and temperature-compensated sensors are available in versions that differ in pressure range, pneumatic connection, output signal, and now also different I2C addresses. Like all Sensirion differential pressure sensors, the SDP800 series is based on Sensirion's patented CMOSens Technology. The differential pressure is measured by a thermal sensor element using the flow-through principle. Thanks to this, Sensirion's differential pressure sensors come with no zero-point drift and outperform traditional piezo-resistive membrane sensors in terms of sensitivity at low differential pressures, offset drift and hysteresis. The sensors are not susceptible to shocks and temperature cycles.